The cavorting of young men and women who gather during farming holidays is a custom in villages [the country]. Among [them] is a wanton woman, and though called Oyuki [Snow], her face, not resembling her name, is dark [shallow black], but though she was sooty from the smoke of charcoal burning in peaks that catch the clouds, even mountain tea [can be] the prime of color of a budding flower. And while privately seeing Benzo she is also playing around with Timberman Nanigashi, who had come from Ōme. Benzo [heard] a rumor that [she] was lodging [his] seed from a secret meet [tryst] at a boar-hunting hut. Jealous and angry, one night carried a log and bludgeoned to death Timberman Nanigashi, who had been working in the mountains. [His crime] quickly became apparent and he was pulled to the District of Ōmiya, went through trial, and was sentenced to hang. Oyuki hence wanely vanished. Life is miserable. her face . . . is dark [shallow black] . . . even mountain tea [can be] the prime of color of a budding flower refelects 貌ハ . . . 浅黒き . . . 山茶も出花乃色盛 (kao wa . . . akakuroki . . . yamacha mo debana no irozakari). This phrasing alludes to a proverb that has numerous variations, one of which is 鬼も十八 番茶も出花 (oni mo jūhachi / bancha mo debana) -- structurally "a demon is 18 / even coarse tea is a budding flower" -- meaning that an ugly demon can be beautiful, that even course tea, freshly picked and steeped, has a nice fragrance -- i.e., an even an ugly woman can be attractive at a certain point in her life. This roughly corresponds to the English expression "Everything [is good] in its season" or "To everything [there is] a season". The newspaper version (Tsuchiya 2000) has "dark complextions too are the boiled leaves of village tea" (浅黒き色も村茶の煮花にて asakuroki iro mo muracha no debana ni te). 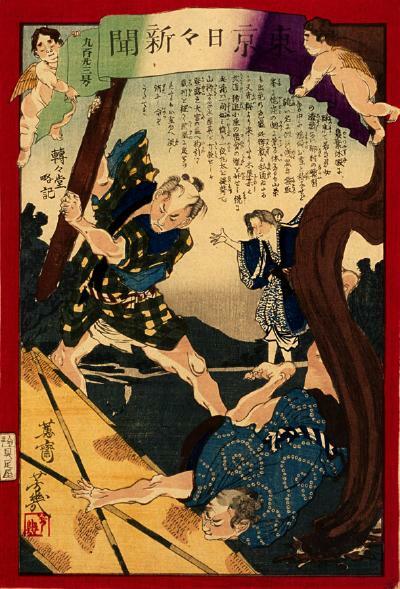 Other versions of the proverb include 鬼も十七 茨も花 (ono mo jōnana / ibara mo hana) and 鬼も十七 山茶も煮端 (oni mo jōnana / yamacha mo nibana). For another story featuring a woman whose complexion is dusky because of charcoal, see TNS-754 Woman rebukes keiko. peaks that catch the clouds reflects 雲取峯 glossed "kumo toru mine" -- a verbal expression. Today the peaks are associated with Kumotoriyama (雲取山) or "cloud-catching mountain", which straddles three prefectures: Tokyo (Oku-Tama-machi), Saitama (Chichibu-shi), and Yamanashi (Tabayama-mura). A person called Benzo of Mitsumine village (三峯村) in the Chichibu district of this province (本州 honō) and Oyuki the daughter of Tatsujiro of the same village were privately involved, and on a holiday at a time when by custom in [such] villages young men and women assemble and frolic, Benzo spotted in the distance a young man snatching a hand towel of his Oyuki . . . . The best-known shrine in these well-known mountains is Mitsumine Jinja, which celebrates three peaks -- Myohogatake (妙法が岳), Shiraiwayama (白岩山), and Kumotoriyama (雲取山) -- collectively called Mitsuminesan (Mitsuminesan) or Mt. Mitsumine. Mitsumine village was in the vicinity of the shrine. From 1 April 1889, Mitsumine and Nakatsugawa villages were absorbed into Ōtaki village. From 1 April 2005, Ōtaki village was absorbed into Chichibu city. The three place names survive but not as villages. Timberman Nanigashi reflects 木屋某 -- which means "a certain timberman" (timberman so-and-so) whose name is not known. Family names, though required by the 1872 Family Registration Law, were not yet customary among commoners. Personal names, even when known, might be suppressed in favor of family names, occupational names, or titles. In many stories, individuals and even families were commonly identified by their "occupation" plus "so-and-so" -- e.g., 熊沢某 (Kumazawa nanigashi, Kumazawa so-and-so), 畳屋某 (tatamiya nanigashi, tatami matter so-and-so), "商某 shō nanigashi, merchant so-and-so, 濃何某 nō nanigashi, farmer so-and-so). Writers sometimes graphed "nanigashi" (某) as 何某. When affixed (prefixed or suffixed) to names or occupations in more formal contexts, the graph 某 is read ぼう (b&$333;) -- e.g. 某氏 (boōshi, a certain person), 松山某 (Matsuyama bō, a certain Matsuyama, Matsuyama so-and-so), 某銀行 (bō ginkō, a certain bank, such-and-such bank). Women were usually represented by personal names only. Men were more likely to be introduced by their family and personal names, and then referred to by their personal names. However, in stories featuring lovers, both the man and the woman are typically known by their personal names -- hence Benzo and Oyuki. lodging [his] seed (胤を奸せし tane o yado seshi). The newspaper article stated that Oyuki was pregnant (妊娠ほどに成りし ninshin hodo ni narishi), and disclosed that after the trial and sentencing she returned from the prefecture and "the lump of flesh in her belly dropped in birth" (腹の塊肉ハ産ミ落せし fuku no katamari niku wa umiotoseshi). For another story featuring seeds and birth, see YHS-527b Thief gives birth. The District of Ōmiya (大宮の区 Ōmiya no ku) was one of many administrative regions under the "large district, small district system" (大区小区制 daiku-shōku sei) that was set up in 1872 to facilitate the nationalization of local communities, beginning with the nationwide registration of households. This scheme was replaced by the "district, ward, town, village system" (郡区町村編制 gun-ku-chō-son hensei) in 1878. City, town, and village" (市町村 shichōson) distinctions began in 1889. The town of Ōmiya (大宮町 Ōmiya-machi), created in 1889, became the city of Ōmiya (大宮市 Ōmiya-shi). The city of Ōmiya is now Ōmiya ward (大宮区 Ōmiyaku) of Saitama city (さいたま市), a megatropolis born on 1 May 2001 from a merger of Urawa, Yono, and Omiya cities. Life is miserable reflects 命ぞうたてき (inochi zo utateki). The present-day equivalent would be 人生はつらい (jinsei wa tsurai, life is tough).